Meet the Builders - Hallmark Homes Inc.
Hallmark Homes is owned and operated by Scott and Vicki Moran in Bismarck, ND. Both being raised in small towns of North Dakota has given us the need to continue the “mom and pop” tradition we have all grown to know and love. 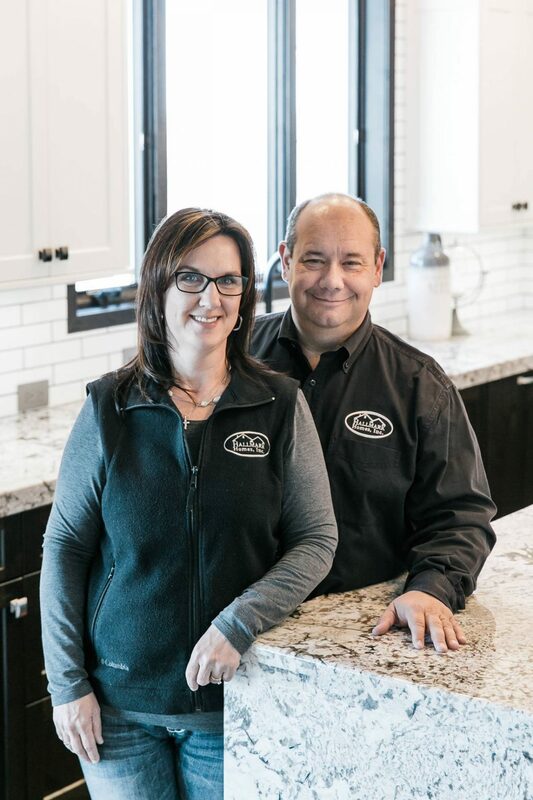 Scott and Vicki work together to fill the needs of each and every client throughout the building process, walking you through from the site analysis, perfecting your blueprint, interior selections and on to the final walk through of your completed home. We offer a family owned business devoted to working directly with clients, building personal relationships and sharing creative ideas to make your home unique to you. At one point in time, Scott used to go to work with his grandpa building homes in Jamestown, ND and works hard to continue the values instilled in him from those days. At Hallmark Homes, we use top quality materials and trust worthy suppliers that reflect our commitment to excellence. Our valued subcontractors are an integral part of who we are and have been selected for their fine craftsmanship and work ethic. It is important to have a good relationship and understanding to save time and frustrations at the job site for everyone involved.We are thankful to have developed many cherished friendships through the years with so many of our homeowners we have worked with and look forward to meeting you. Our Mission At Hallmark Homes we want to make building a home enjoyable and rewarding for our homeowners by listening to their specific needs. Some people can visualize the completed home they will live in but most cannot, so at Hallmark Homes, we make sure we have an understanding of your wants and needs as a home buyer in order to incorporate your ideas combined with our ideas to fulfill your dream home vision. Building a home shouldn’t be a chore but rather an exciting adventure you go through with a home builder that you can trust and one that will maximize your experience to be memorable and positive. Our Philosophy To build quality homes for you to enjoy by being fair and honest while allowing a home buyer an opportunity for personal expression. We believe in hard work and hands-on job sites. 2019 Hallmark Homes Inc. | Bismarck, ND | Website Design by Up & Running Design Co.